And that has also been my stance on the matter. Until now. One day in December, my coworker Kevin came to me with an unexpected request. He’s getting married at the beginning of April. He’s already been fitted for a tuxedo, he’s seen some of the things I’ve made, and would I make him a tuxedo shirt to wear to his wedding? My first reaction was something along the lines of a deer in headlights – I had never expected anyone to ask. At first, I didn’t know what to say and didn’t give him an answer. He made it clear he would be willing to pay for the effort. After spending the rest of the day considering the challenge involved, and the commitment it would take, I came back to him with a response. And so my first client was engaged. As I’m about to enter my sixth decade of existence, I have to say that I’ve never worn a tuxedo. I’ve always gotten away with wearing a suit to most special occasions. So I didn’t know much about the shirts that one wears with a tux. I did some research both in books and online about what tuxedo shirts are all about, and the types of style variations associated with them. I’ve assembled a Pinterest board with links to all of my online research. For books, my references were “Dressing the Man: Mastering the Art of Permanent Fashion” by Alan Flusser, and “The Indispensable Guide to Classic Men’s Clothing” by Josh Karlen and Chistopher Sulavik. I also got some help from David Page Coffin (DPC). I emailed him directly asking for any assistance he might be able to provide, and he graciously pointed me to an article he wrote on constructing tuxedo shirts that ran in the Febuary/March 2014 issue of Vogue Patterns magazine. I purchased the back issue online. It covers making a tuxedo blouse for a woman, but all of the details he describes in the article would work unchanged for a men’s shirt. He covers a wide range of style details, including the necessary pattern modifications. It turns out my client already had a role model and a style in mind for the shirt, namely Daniel Craig as James Bond. or (for those who are not traditionalists) a plain front. 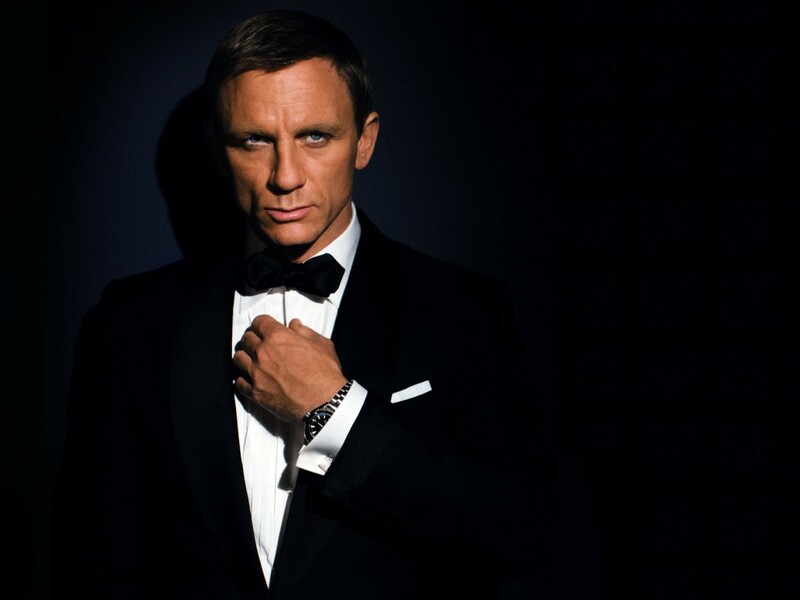 The plain front is the Craig-as-Bond style, and the one Kevin prefers. Which makes things much easier for me construction-wise. I went with Kevin on a scouting trip. At a well-known men’s clothing store, he showed me two off-the-rack shirts to use as models for the final product, both of which contain elements he’s looking for. Even with the plain front, there’s a decision to make about the center band placket. I’m choosing to make a standard sewn-on center band, rather than a hidden button placket (described along with pleating in the DPC article) or a cut-on front band that folds in on itself to form a self-facing. 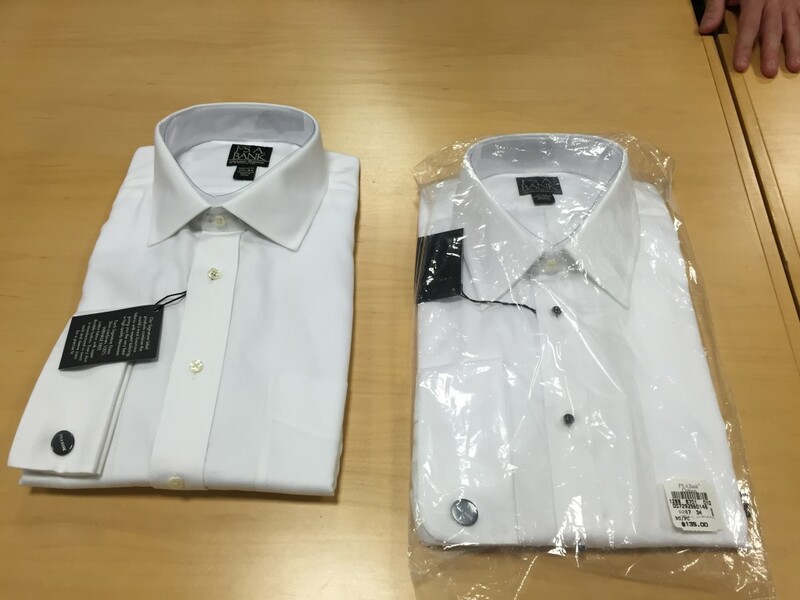 Another interesting approach comes from Proper Cloth, an online made-to-measure shirt maker. They actually put buttonholes on both under and upper front bands, then make a removable “button strip” of buttons attached to twill tape. To wear studs, just remove the tape. Kevin has told me he doesn’t like to wear studs and simply wants buttons. If there’s anything I’ve learned from watching years of “Project Runway” client challenges, it’s that you put your interests as a designer ahead of the client at your peril. Personally, I feel like it’s not a proper tuxedo shirt if it doesn’t provide an allowance for studs, but I also know it’s a feature he’s not going to use. I haven’t decided yet which approach I will use in the finished shirt, but speaking as an engineer, I love the elegance of the Proper Cloth solution. Discussing the front band is a perfect segue into buttons. 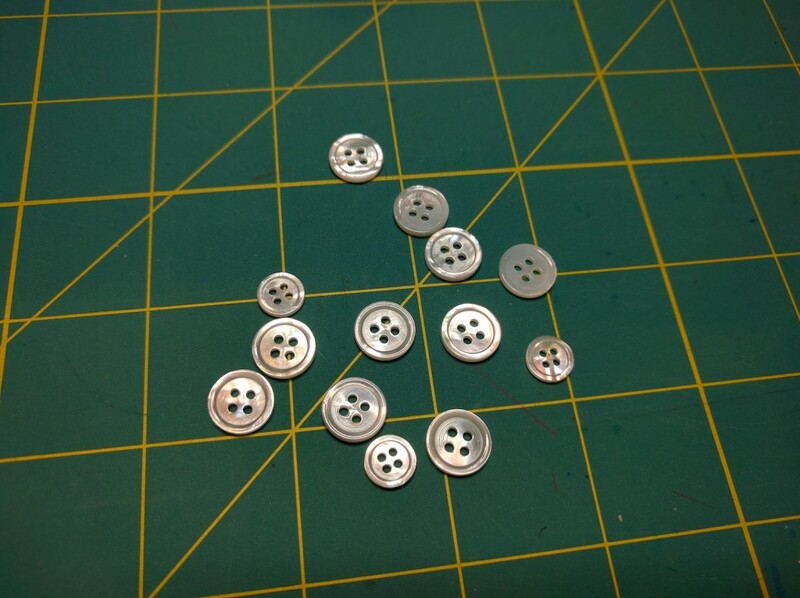 I looked at several online sources, including some Etsy sellers, and eventually found these mother-of-pearl buttons from Benno’s Buttons. I got sizes for front band and sleeve plackets. The turn-down collar, similar to the collar you see on most men’s dress shirts. The mandarin collar. This is a non-traditional choice for younger men who feel their tuxedo must make a statement. The wingtip collar. This is the true choice for a formal shirt, and DPC covers making a wingtip collar in his Vogue Pattens article. My client prefers a British-style spread collar. In fact, the model shirt he brought me (also from the Famous American Shirtmaker I’m using for my own shirt pattern) has a spread collar that I’m carrying forward into the finished shirt. This one was easy; Kevin told me he wants french cuffs. As a variation, I showed him the single-fold french cuffs which DPC features in his Vogue Patterns article, which he writes were a favorite style choice of Fred Astaire. This example single-fold french cuff is taken from the article. In the end, we decided to go with the traditional double-fold french cuff. Currently I’m planning to make the cuff square, simply because it is easier to make. 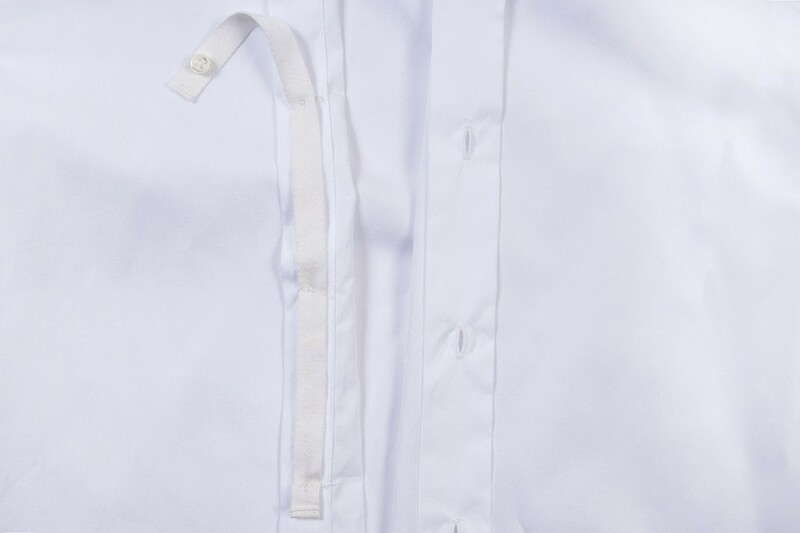 The shirt will also have a standard sleeve placket, which requires a bit of special handling for a french cuff. The underlap portion of the sleeve placket must be folded inward to the wrong side of the sleeve before attaching the cuff. This allows for both sides of the cuff to fold outwards and accept a cufflink. Initially this didn’t make sense to me, but looking at a french-cuff shirt in my closet sorted out the confusion. I’ll have more to say on this topic when we get to patternmaking for the sleeve. I took my client on a shopping trip to Britex Fabrics, where we looked at fabric choices for the shirt. 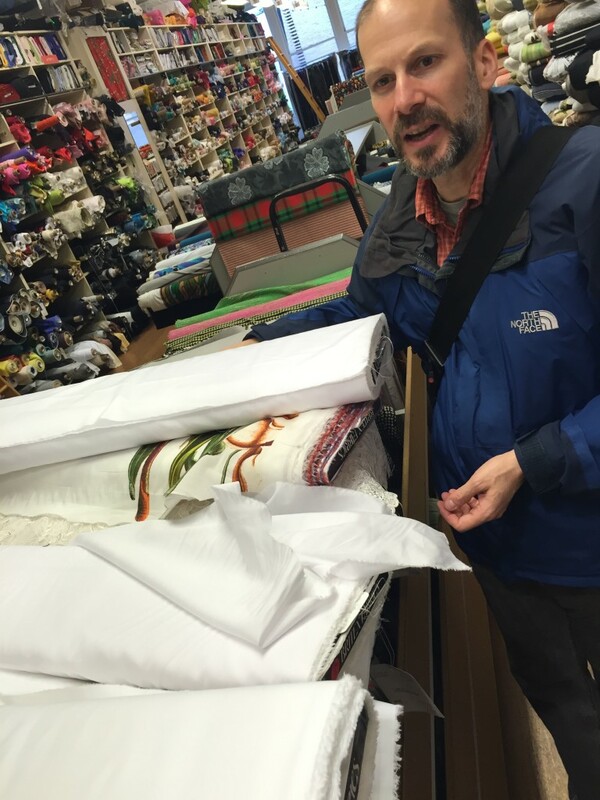 Kevin snapped a photo of me blathering on about the comparative qualities of the fine shirting cottons on display. One consideration in choosing the fabric is the color and tone. A white fabric is of course the standard choice, but the tone of the fabric also has to coordinate with the bride’s wedding dress. If the bride has an off-white or ivory wedding gown, and the groom has a bleached-white shirt, the two will clash and the groom will make the bride’s outfit look dingy. So with that in mind, we walked out with several fabric swatches. I also obtained fabric samples from Stonemountain and Daughter Fabrics in Berkeley, which had some really wonderful Pima cottons to choose from, as well as two online options – Michael’s Fabrics and Farmhouse Fabrics. Both sent me swatches to evaluate. The leading choice before the arrival of the online samples was the cotton/silk blend you see in the photo above, which had a nice sheen. But the winner was this Italian-made shirting from Farmhouse Fabrics. The fabric is a little heavier weight than you expect for most shirtings (the description on the website said “also suitable for tablecloths and napkins”) but I think I can still work with it. The fabric has the makings of a really nice shirt. I bought twice what I needed, as an insurance policy and to perhaps make another shirt for myself or someone else farther down the line. The price was utterly amazing – $5.59 per yard. Between the time I ordered the swatches and placed the order, they greatly dropped the price. Perhaps the fabric was put on clearance. I don’t care – that’s an unheard-of price for fabric of this quality. I’ve been through two fittings with the client so far, and currently I’m working on a third muslin. It’s not quite a wearable muslin – I’m taking shortcuts with the seam finishes, and it’s still being worked up in actual muslin fabric – but it will have all the cuffs, collars and detailing so we can get an idea of what it looks like on Kevin. I’ll be writing more about this project as it develops, and I hope to tell you about my experiences with the fitting sessions. As for my own “Holiday Shirt” project, it’s been put on hold for the time being. But I do need something to wear to a wedding. 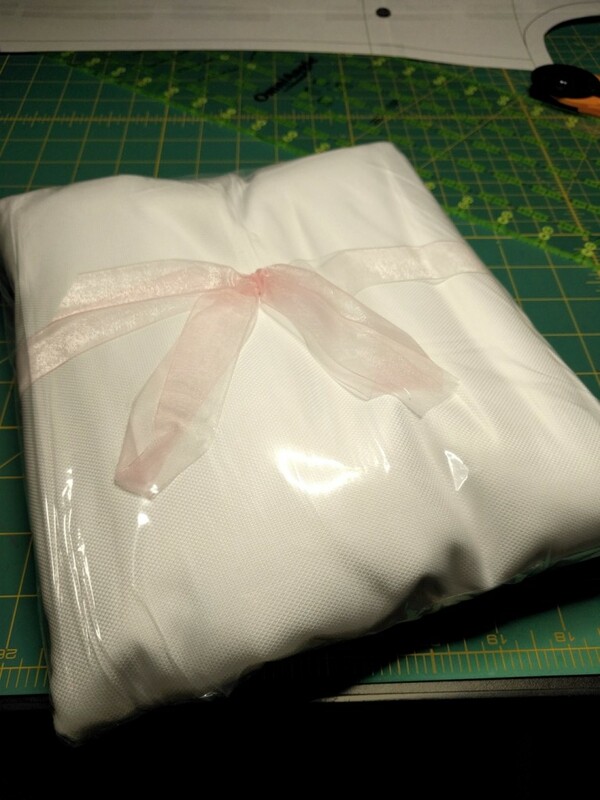 Fascinating post, thanks Michael:) And congrats on the fabric choice, an excellent deal, and I’d much rather be working on something a tad too thick than a tad too thin. Pleased to hear that Farmhouse was willing to send a sample; I’ve never managed to even hear back from them when requesting a swatch, but I do love the selection there and usually the prices. Looking forward to the next installments! Farmhouse Fabrics is a little inconvenient in terms of swatches. You have to send them a self-addressed stamped envelope with a cover letter indicating which fabrics you’d like samples (including the SKU). The letter I sent them came back with the swatches taped to the letter. I believe there’s a limit of five swatches per letter; I asked for three. Glad to hear your endorsement of a weightier fabric. As always, I’m concerned about bulk when pressing out lines for cuffs, collars and plackets. I guess I missed those instrux, thanks. I didn’t mention it above, but the fabric sample from Michael’s Fabrics came in on the thin end of the range, and was close to semi-transparent. I’m hoping the finished shirt will not be too warm to wear with a modern tux, but we’ll see. I only tweak patterns because I don’t ever plan on sewing for anyone besides myself and my husband. I see you have had a master plan all along of sewing for others. So now I understand your great interest in perfecting patterns and drafting. I am sure your tuxedo shirt will be great. How exciting. And wow your client seems to know a lot about the different options – a worthy client indeed! Can’t wait to see what you “whip up”! I’m impressed that you would undertake such a project. Knowing how long it takes me to make a shirt, especially a fresh pattern, investing that much time would be for the love of the craft and not for profit. But I followed your link to Farmhouse Fabrics and couldn’t resist ordering a few yards of shirting. You may have aided my fabric addiction. Good luck on the project and I look forward to progress reports! For sure I’m dumping a ton of time into the project and with a month to go, I’m already stressing over the deadline. I’m tracking hours with an app on my phone, and I expect my actual “wages” for the work to be incredibly low. I took on the project for the challenge, for the learning, and to further build my fitting skills. I did start by tracing a shirt that fit the client very well, so that was a big help. Glad you liked Farmhouse Fabrics! Impressive the amount of research and learning of the craft that you are doing. You’re client chose well. Great job so far, keep us posted. In addition to the free-lance design work I do (paid work), I also have to do the costuming for the ballroom dance team that I belong to (non-paid). And , of course, the men need white wing tip collar tuxedo shirts for our performances. I have a reserve stock of shirts available, but I always tell the guys, ” a grown man should have his own tuxedo shirt !” Or, as you are doing, research the hell out of it, and make your own! I’m dying to get an update on the shirt. And I am hooked on Farmhouse fabrics. 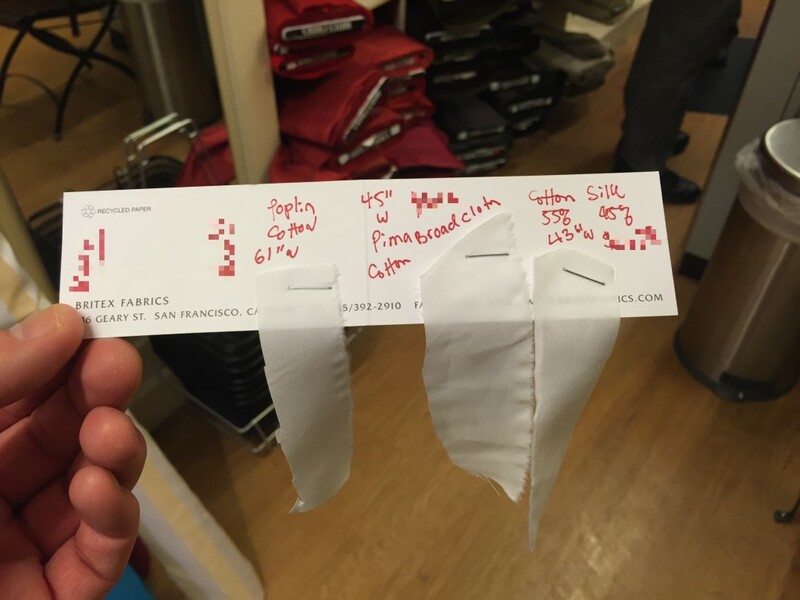 Their “bundles ” of high end shirting average about $7/yard. I can’t buy crappy muslin for that. Your public awaits the big reveal. Michael, I promise updates very soon. I’ve been so busy working on the project that I really haven’t had time to blog about it, at least not at the overly pedantic way I usually like to write.